Anything else is a false economy; because come summer, you’ll have to spend even more time and money to repair the damage caused to your pool by ignoring it over winter. By ensuring that your pool is as clean as possible, before it lies dormant over the winter months, will greatly reduce the chances of algae forming. Thoroughly scrub the tiles, ensuring that you get into all the corners and remove all of the debris. A pumice stone is handy for removing stubborn stains off the tiles. Shocking is super chlorination; it’s basically a dose of oxidizer into the pool. Shocking removes contaminants and clears up haziness. Doing this before and during winter will keep the water fresh. Be sure to use some common sense precautions in working with shock; always work with it where you can have plenty of ventilation. Add the shock to the pool and use a brush to stir up the chemicals then run the pump for a few hours so that it can spread evenly throughout the water. To prepare for the months where the pool won’t be used, you need to do a thorough cleaning of the pool filters, skimmers, and any other cleaning equipment that you have in the pool. This helps the ongoing cleaning and also stops bacteria and debris from developing into something much more horrible. Any scum or scaling in the filter will be harder to remove if you leave it in the filter over winter. A pool cover or pool blanket stops debris from falling in the pool and also reduces water evaporation. 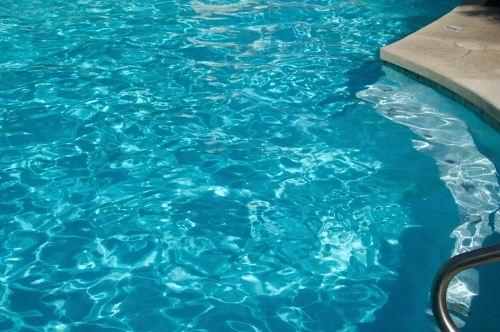 Be sure to let the pool air out regularly though as algae can grow in water that is covered for long periods of time. Also make sure water isn’t accumulating in excess over the cover all through winter. A little water is ok — it actually helps hold the cover down — however too much water strains the cover. Even though you are not using the pool, try to run the filters and cleaning systems for a few hours each week to ensure that they are still running properly and not seizing up in any way. Finally, before you let your pool go dormant, you need to check the pH, chlorine, and alkaline levels of the pool. You need to make sure that these levels are all ideal. Ask your pool supplier or pool shop about a water testing kit or service so that you can make sure everything’s right. The addition of an Algaecide is also recommended – use the recommended dosage for your specific volume of pool water. To sum it up: The cleaner you put the pool to bed, the cleaner you’ll wake it up! 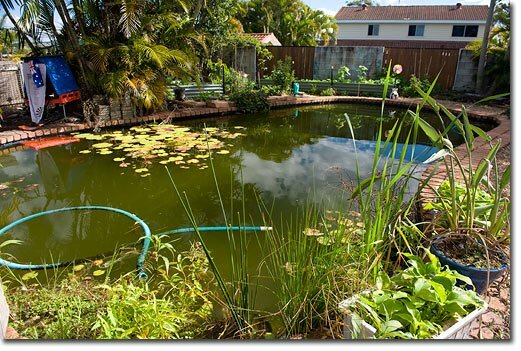 Or if your pool is beyond saving, you could always consider converting it into a permaculture fish pond!